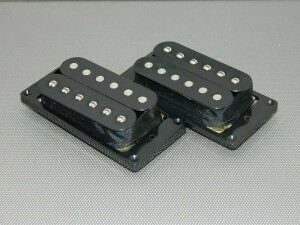 The Ironstone Humbucker pickups use Alnico V magnet pole pieces, giving warm, dark velvety vintage tones. The high resistance / winding level then adds an individual character, giving stunning dynamic range and sensitivity to playing style. The Humbucker sound clips below give a representative sample of the tones available from this style. Great for playing that aims to capture those vintage classic Humbucker Blues and Classic Rock styles, but with a potent output if you want to drive hard! Think Moore, Kossoff, Page, Walsh, Green etc. Ironstone are happy to include good quality customer's Humbucker sound clips - please just get in touch through the Contact Us page. Thanks to Nev Jones for the first two professionally recorded clips using a Zoom 4040 direct to PC with Adobe Audacity. Then thanks to Dave Taylor for an extended Humbucker blues piece (showing the wonderful clean to drive dynamic range), using line6 ux2 into sonar home studioxl with gearbox plugin (plexi amp), tube driver od, reverb and a dash of delay. It switches between both pups, with the tube driver on for the second section. And more Drive tone recordings from Nev Jones. The first two extended pieces are from Nev to show off the Ironstone Humbuckers in full flight. That is followed by a piece from Erik Spiekermann, on one of his custom guitars from es-music (www.es-music.nl) in the Netherlands. Thanks to Hans Gruber over in Germany for his humbucker demo and a wonderful visual collage of his local area to go with it. On the heavier side of life (and for Black Sabbath fans), thanks to Ian Devlin for demoing the Ironstone humbucker in the often overlooked neck position. The clip has both clean and distorted tones played through a Marshall JCM 900 amp. My thanks to Neville Campbell-Barker (lead guitar with the UK's no. 1 Killers tribute band The Killerz) for an amazing selection of Facebook video clips from shredding to classic themes. He's demoing an HSS Ironstone combination, but its the humbucker bridge that stars. To show the mellow side, a lovely version of the Hendrix classic, Wind Cries Mary. Thanks to Kieran Docherty-Gilroy (and his Dad Rob who built him the guitar!) for the clip. Another from Kieran, this time a very smooth version of the Gilmour classic Coming Back To Life. Once again the Ironstone HSH pickup configuration guitar.